The Company is run by Stanzin Tsering, a motivated and experienced Ladakhi, who has guided treks throughout Ladakh for several years before starting his own company. He is registered (Reg No. TRM/TRL-270/2011) as a travel agent and tour operator under the Tourism Department Jammu & Kashmir, Government of India, with its main office in Leh / Ladakh and also associated with All Ladakh Tour Operators Association (ALTOA). Lynx is a rare wild cat spotted often in Ladakh and from here comes the name Lynx Expedition. Plan your perfect trip to the mesmerising Ladakh with us. The thrill of finding oneself in the midst of snowy peaks, glaciers, unparalleled slopes, crystal clear river and lust green fields of wild flowers is an unmatched experience. Ladakh is liked by all, whether it is an eager traveler, a fun visitor, an adventure lover, an environmentalist, a wildlife researcher, a photographer or a monk in search of peace. Great care and concern is shown for Nature during in our tours! Count on us to provide all the elements of an exciting adventure, vacation getaway while balancing yours schedule, budget and interests. Lynx expedition warmly invites you explore Ladakh and discover your ideas travel-experience. Experience that is uniquely yours own. We are glad to have served our valued guests from Spain, Italy, France, Germany, Russia, United States of America, Canada, Argentina, Chile, Brazil, Mexico, Israel, Thailand, Singapore, India and other countries. So don’t miss your chance. Over the years, we have organized tour packages in Ladakh and Himachal Pradesh, trekking in Zanskar - Markha valley - Nubra Valley, Jeep Safaris to Tsomoriri Lake - Pangong lake - Tsokar lake, Camel Safari in Nubra Valley, Yak safari in Changthang, Spiritual Tours and Technical Expeditions to Stok Kangri - Matho Kangri - Nun Kun. 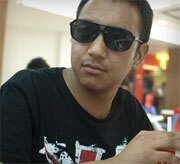 Stanzin Thinless : A graduate from Punjab University, Stanzin has been associated with us from the past 3 years. 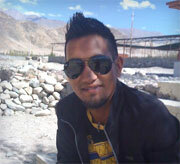 Hailing from Nimoo/Sham area of Ladakh he is been working as trekking and cultural guide in Ladakh and Zanskar. At the end of tour all his clients feel happy and satisfied as he charms them with his knowledge and humble nature. He has experience of 8 years in this line as a guide.He was published in "SYDNEY MORNING HERALD"A sydney based travel newspaper in march 2013. A travelling fool is better than a sitting wise man!